Pursues an unknown agenda, frequently using runners to accomplish his goals. Rumored to be an immortal elf. Mentored Jane. Recently fought a massive street battle one-on-one with Ghostwalker through the streets of Denver, ended only through the intervention of Jane and Ehran the Scribe. His on-again, off-again feud with Ehran seems friendly at the moment, possibly due to Jane’s intervention. 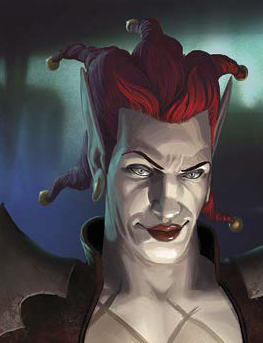 Word on the street is that some sort of “Dark Harlequin” (which seems to be a separate entity, using the name Gwynplaine) has been hiring runners for a variety of destructive tasks, especially targeting elves and the awakened. Used to post on Shadowland as Laughing Man before everyone switched to Jackpoint. Had a close, yet antagonistic friendship with Dunkelzahn.